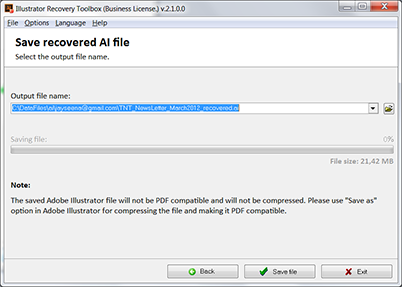 If you have ever come across the problem of corrupted Adobe Illustrator files, it will be a pleasant surprise for you to learn about Illustrator Recovery Toolbox (download) - an easy-to-use tool that will easily recover information from files of the ai format. 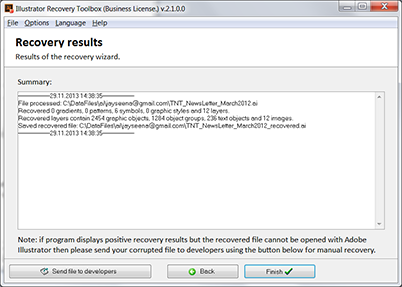 The developers of Illustrator Recovery Toolbox did their best to create a tool that will allow any user, even of they do not have enough experience, to easily recover data from corrupted Adobe Illustrator files. The interface of the program is a step-by-step wizard with as few control elements as possible. In the first step, you should select the corrupted file to recover data from. To select the file, type the full path to it and its name in the field located in the center of the program window or use the standard Open dialog box. You can also select one of the previously used files from the drop-down list opened with a click on the button with a triangle on it in the right part of the input field. After you type the file name, click the Recover button. The next step is completely automatic. 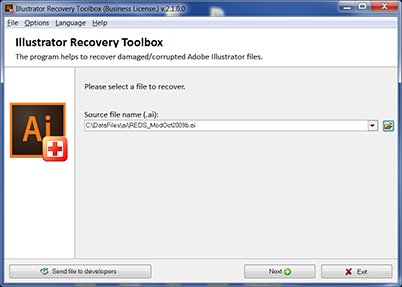 Illustrator Recovery Toolbox will analyze the structure of the file step by step and Adobe Illustrator recovery file recovery data from all available layers. The time this process takes directly depends on your computer performance and the size of the corrupted file. The output file the recovered data will be saved to is selected in the last step. Take into account that the saved file will not be compatible with the PDF format and the data in it will not be compressed. Use Adobe Illustrator to compress the file or to convert it to the PDF format. This is the last step of the data recovery process. After the program saves it, it will offer you to view the log with completed operations. After that you can click the Finish button to finish working with the program. If you want to continue recovering data and select another corrupted file, use the Back button to get back to the previous steps. How to save Adobe Illustrator file recovery crash after power surge? If the file you are currently working with it corrupted too much and the .Illustrator Recovery tool fails to recover it, you can send it to the developers of the program. To do it, use the Send file to developers button. The employees of the company will analyze the contents of the file, try to recover its contents manually and then contact you to let you know about the results. Adobe Illustrator can be undoubtedly called the most well-known and popular application for creating vector graphics. After appearing on the market in the late 80s as a font editor, the program has come a long way to its final fourteenth version and is now a powerful professional tool with hundred thousands of users around the world to Fix recovery Illustrator documents. From inexperienced students learning the basics of graphics, animation and design to sophisticated professionals with years of experience - anyone will find what they need in Illustrator. Due to the popularity of Adobe Illustrator among professionals, it is often used to carry out the most responsible tasks that take dozens or sometimes hundreds of man-hours to complete. It is obvious that an accidental loss of such results may turn into a real tragedy, especially if there is very little time left till the materials are to be delivered. Unfortunately, Illustrator is not protected against all kinds of computer accidents any better than any other software. There are all kinds of reasons for failures and data damages - from power surges and hardware failures to incorrect user operations and virus attacks. 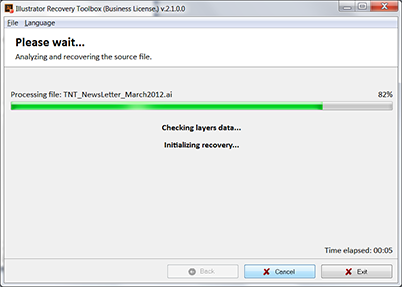 Data recovery may turn out to be the only way out in these cases with the Adobe Illustrator file recovery tool. How to recovery Illustrator files? How to recovery Illustrator files? Illustrator Recovery Toolbox is a simple, convenient and reliable tool that will allow you to quickly and easily recover corrupted Adobe Illustrator files. Only several mouse clicks and you get the results of your work back and recovery Illustrator file!